Philippine Business Bank (PBB) posted a net interest income of P2.2 billion in the third quarter of 2017, 17% higher than the P1.8 billion reported in the corresponding period last year. This marked the third time this year the bank, which largely services small and medium-sized enterprises, recorded a double-digit growth in quarterly net interest income. 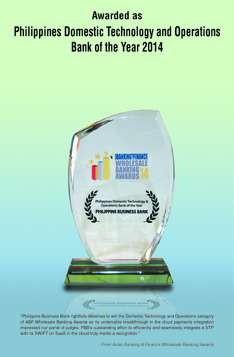 It also continues to reap the benefits of the reorganization of its account management services. Loans and other receivables grew 37.4% to P65.1 billion in the nine-month period ending in September. According to Dave Sison, head of corporate planning and investor relations at PBB, that growth figure beat their own expectations, which ranged between 25% to 30%. "It's a proof that the thesis of what we wanted to do in 2016 is working, and now we're better able to service the needs of our clients which are the SMEs," he said. Interest income from loans and other receivables, as a consequence, increased 29.8% from P1.96 billion to P2.54 billion. The bank's total resources also rose to P80.2 billion. The nine-month core income swelled to P673.7 million as well, a 50.6% jump from P447.3 million from last year. "We're doing better than expected, and it's shown by the expansion of all our core income numbers," Mr. Sison said. The third quarter saw PBB increase its low-cost funds to P31.1 billion and achieve a loans-to-deposits ratio of 97%. Time deposits during the first nine months of the year had already hit P35.9 billion. Total deposits stood at P67 billion, up 23.8%. "Mirroring the rapid growth of the Bank's loans and other receivables, our branches have doubled their efforts in raising PBB's deposits, resulting in a P12.9 billion increase from last year's P54.2 billion to P67.0 billion this year. To further boost our deposit generation process, PBB will continue to tactically expand its footprint throughout the Philippines to reach all corners of the country," said Roland Avante, president and chief executive officer of PBB. 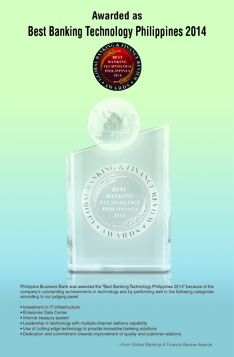 Last month, PBB completed the conversion of the branches of the thrift lender Bataan Savings and Loan Bank it acquired in 2015 as part of its expansion effort, bringing the total number of its branches to 142. It is expected that the conversion of the branches of Insular Savings Bank, another PBB acquisition, will cause the number to shoot up to 152. Meanwhile, the bank made the conscious decision to limit its trading activities because of the lack of trading opportunities that was caused by the pressure on the interest rates to go up. This move resulted in lower trading gains of P16.7 million. PBB also experienced an increase in loan loss provisioning to P177.1 million owing to the changing regulatory requirements and implementation of the Philippine Financial Reporting Standards 9 or PFRS9. "I think after 2017 when we've completed most of the 'catch-up provisioning,' we'll be in the clear for 2018." "We believe that 2017 serves as the baseline year of PBB's re-engineered balance sheet that will deliver better business performance in the years ahead. We expect to remain at the forefront of providing financing to our partners in the SME space, and we are optimistic that we have successfully repositioned the Bank to capitalize on the rapidly growing Philippine economy," Mr. Avante said. For his part, Mr. Sison said, "Hopefully in the next couple of quarters we'll see a better reflection of our true earnings."